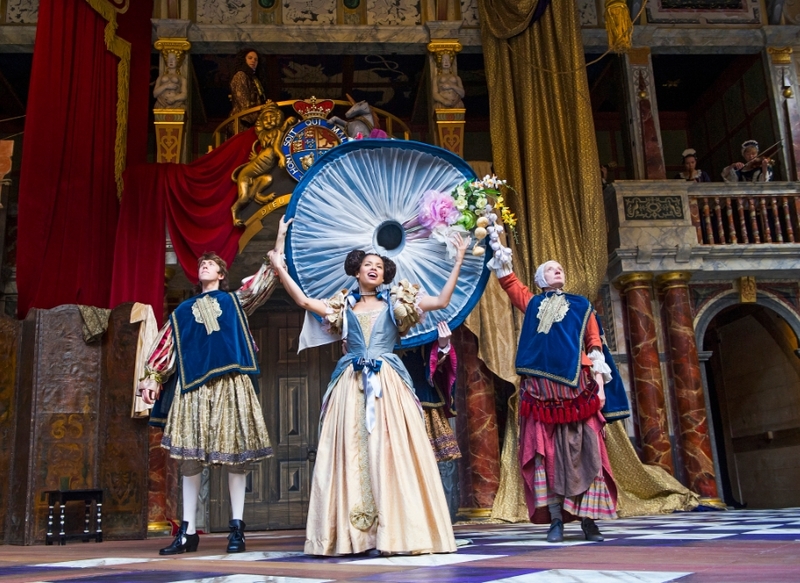 Jessica Swale’s second play at the Globe, directed by Christopher Luscombe, is raucous, witty and wonderfully fun. From the opening prologue, delivered in a quavering voice by the King’s Company’s youngest member Ned (Angus Imrie), the audience are delighted, roaring with laughter at the wealth of quips and comedy that abound throughout the production. Portraying Nell’s progression from orange seller to actress, and then mistress of the king, Gugu Mbatha-Raw radiates, effortlessly capturing the hearts of Charles Hart (Jay White), leading actor in the King’s Company, and of the King of England himself (David Sturzaker). A play about players, Nell Gwynne is packed full of literary allusions and meta-jokes, and some glorious bouts of declamatory acting. Gwynn’s initial training from Hart reveals him to be king of hammy and overblown performance. His outrageous style is matched only by Greg Haiste, who plays Edward Kynaston, the player who has mastered playing the mistress and is apoplectic with rage upon discovering that women are to play upon the stage, denouncing ‘actor-esses’ and exclaiming bitterly that no woman can play a woman as well as he can. Overblown performance is a recurring feature of the play, which delivers in terms of gaiety and humour but fails to impress in poignant scenes. It is perhaps, then, a relief that more meaningful moments are few and far between. What the play lacks in profundity it certainly makes up for in one-liners and novelty, much appreciated by an excitable audience (the appearance of a real-life spaniel onstage took the biggest cheer of the night). It is disappointing, however, that the rich and complex story of an early feminist icon is lost to the light-hearted trappings of this Renaissance romp. What is an immensely entertaining production often veers close to pantomime, sacrificing sincerity for silliness. Still, Swale certainly knows how to excite an audience. Nell Gwynn is on at Shakespeare’s Globe, 21 New Globe Walk, Bankside, SE1 9DT until 17 October. Tickets from £5-£43. Londonist saw this production on a complimentary ticket.